Canonization is a public and formal act of the Roman Supreme Pontiff. By this declaration the Church attests to the sanctity of a Christian who heroically puts into practice in his or her life the teachings of Jesus Christ, the Savior of mankind. This solemn declaration is made during the Holy Mass. After a lengthy examination by the Church regarding how the candidate practiced the three theological virtues of faith, hope and charity, we proceed to this solemn celebration. The Canonization ceremony begins with a formal request by the Prefect of the Congregation for Saints addressed to the Holy Father. Following the presentation of the candidate, the canonization process reaches its culmination as the Holy Father solemnly declares the candidate’s name to be included in the list of the saints to be venerated in the Universal Church. Since 1992, I have had the privilege of taking part in numerous canonization celebrations in Rome. Today marks the fourth instance of an Indian candidate being canonized. Today I am especially proud to say that I knew her personally, as I had the blessing of meeting her on a few occasions. I have always been deeply moved by her fidelity and merciful countenance. I remember fondly an encounter that I had with the Mother while at table in India, when she reminded us of the food that we waste regularly in our meals, the food that the poor could have had. While this is a time of great celebration, we should remember that the most fitting way to honor our Mother would be to find Jesus’ presence in the poor, irrespective of caste or creed, and to serve them as she did. While serving the poor, Mother never neglected her prayer life. Often, her mission to the poor was marked by trials that served to increase her trust in Jesus Christ, as she clung to the feet of Jesus on the Cross, even in the midst of darkness. May the Church in India receive abundant blessings through the intercession of Saint Theresa of Calcutta. This day is very truly a recognition of the poor of this world, who may be proud of their new saint. Rome, Fr. 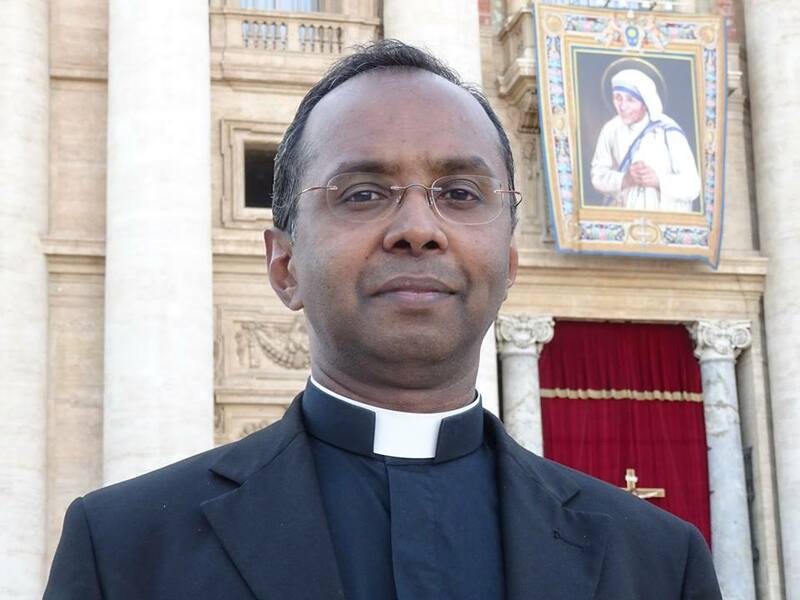 Louis Thevalakara, o.sj.